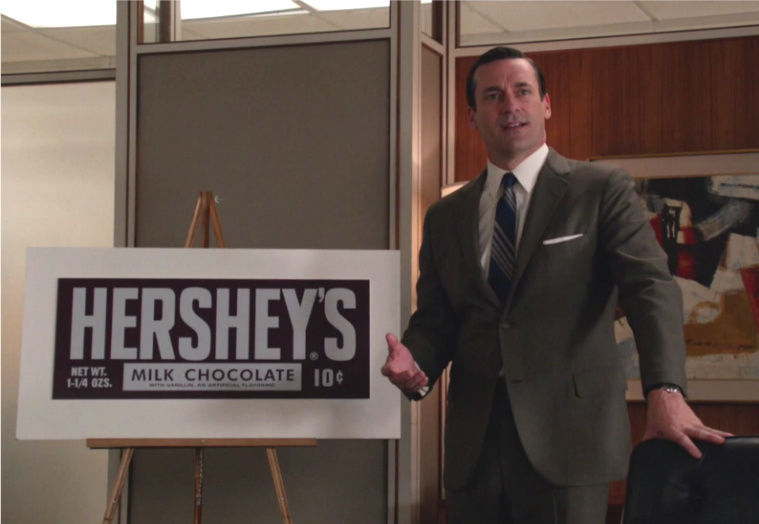 For HR, Madmen is the show that keeps on giving. Last season, Don Draper, a partner and the creative force behind the Sterling Cooper & Partners (SCP) ad agency, had become unpredictable, unreliable and was drinking even more than usual. After a rare display of honesty (he told Hershey executives that he grew up in a brothel, and the only time he got a Hershey bar was when a prostitute bought him one after going through a John’s pockets – hardly the image Hershey wants to be associated with) the other partners decided to put him on “indefinite leave”. While some of the partners thought this was just another way of firing him while providing him with a graceful exit, others saw it as giving him time to sort himself out. One of the latter was Roger Sterling, his long time friend and President of the Agency. So when Don comes to him to find out where he stands after several months of being out of work (but still being paid), Roger tells him he can come back starting Monday. The problem is Roger didn’t consult the other partners. A long debate ensues. Roger thinks that Don’s genius more than compensates for his behavior and doesn’t want him as their competition if he goes to another agency. Others think they are better off without him. All of them agree that, as a partner, buying him out would be expensive. Then there’s the man they hired to replace Don, Lou Avery. Lou is dull and lacks Don’s brilliance. He is also a jerk to his staff. Lou has a two-year contract. During their discussion of what to do about Don, one of the other partners, Jay Cutler, describes Lou as “adequate”. Now there’s a rousing endorsement. Creative Director is arguably one of the most important positions in any ad agency. He or she is responsible for every aspect of an ad campaign. Success or failure relies on this person’s skills, talents and experience. Yet this agency is willing to settle for adequate. I know it’s just a TV show, but in this case, it reflects the real world. Mediocrity flourishes among management throughout all sorts of organizations. These managers are not completely inept, or committing fraud, or causing great losses for the organization. They come in every day, they complete their assigned tasks, they don’t make waves. But they aren’t leaders who are going to grow the organization, either. They make the trains run on time, but don’t expect them to lay any new tracks. In one organization I used to work for, we had one such manager. In discussing his lackluster performance with his supervisor, the supervisor told me that while he wasn’t doing a great job, he wasn’t doing poorly enough to fire him. In other words, adequate was good enough. Meanwhile, the organization suffered. How these people reach management positions is a topic for another day. Once they get there, however, there is one main reason they don’t lose their jobs – their supervisors, senior management, are cowards. Firing, or even disciplining, subordinates can be messy and uncomfortable. You might think that people who have reached the pinnacle of their careers would be used to messy situations, comfortable with conflict. A lot of senior managers got where they are because they were great engineers, salespeople or financial analysts. Leadership never factored into their success. So they are ill-equipped to handle the difficult staffing decisions that come with their position. One manager I know fired an employee one day, only to have him show up the next. Turns out, he was so roundabout in giving the news that the employee didn’t realize he had been let go. This is why I suggest using a script for terminations and sticking to it. It makes an unpleasant interaction quick, clean and clear. Interestingly, many senior managers who have trouble firing someone to his/her face have no problem with laying off hundreds, or even thousands, with a stroke of a pen. Of course in those cases, they don’t actually have to sit across from those being let go – they can sit safely up in their corner office and leave the dirty work for line managers, consultants and HR. In the end, the ad agency in Madmen commits the ultimate sin when it comes to getting rid of employees. They don’t tell Don he’s fired. Instead, they put conditions on his return that are so restrictive they hope that he’ll say no and leave on his own. This cop-out often occurs in real life, too. A manager doesn’t have the guts to fire someone, so they just make work life so unbearable, the person eventually leaves. I’ve had managers suggest this tactic to me. My response – if the employee isn’t a fit for the job, don’t play games. You owe it to the organization, and even to that employee, to cut the cord right now. These managers even have the impression that if the employee quits and isn’t fired, the employee won’t have any grounds for a lawsuit. Untrue. Forcing an employee to quit is called constructive discharge, and if proven, is seen as no different as firing someone in the eyes of the law. This may also have applied to Don’s case. If he had said no to the offer, he probably could have sued and been compensated for his shares in the firm. But Don accepted their restrictions, which either means he has resigned himself to his fate, or has a trick up his sleeve. Regardless, after their poor handling of this situation, maybe its the other partners who should be placed on “indefinite leave”. This entry was posted in Those Who Can't, Teach, Those Who Can't Teach, Manage, What's New and tagged Don Draper, Lou Avery, Madmen, Poor Management.